At today's Reading Wildly meeting, we discussed funny books. 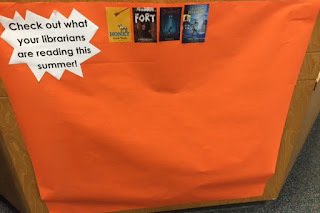 We've discussed funny books in the past and we keep on doing it because this is a genre that kids want all the time and it can be hard to identify these books using the catalog. We talked about some sources for identifying funny books, including lists on the internet and getting recommendations from friends or colleagues. We also talked about how a lot of funny books have parts that are funny and parts that are serious and that there are different kinds of humor that kids may be interested in. Some kids are really looking for wacky, weird humor and others like something more subtle. SUMMER IS COMING, so next month will be Reader's Choice, though I have challenged my staff to read something from the room they don't normally gravitate towards. Staff who normally choose books from the Children's Room should pick something from Teen, staff who normally gravitate towards teen books should choose something from the Children's Room. And if anyone feels like they read pretty equally then they can choose. We probably won't be able to meet over the summer months because we're so busy in our department, but I'm definitely intending a return to our library staff "summer reading log" where we'll share our reading with staff and patrons! This was the start of our "reading log" last summer.